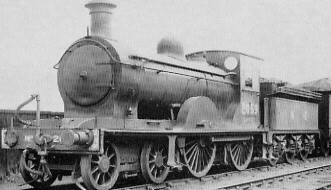 The Holmes 6ft 6in Class M (LNER D31) engines started out as three different classes, the "574", "633", and "729" classes. These were rebuilt by Reid or Chalmers and were grouped together as one class. Built in 1884, the "574" class was the earliest of these classes to be built. They were intended for the Edinburgh-Glasgow expresses, and were smaller than the earlier Drummond D27/D28 Abbotsfords. The design was based on an earlier Drummond design for a 17in cylinder 4-4-0 that was never built, but incorporated a Holmes boiler that was standard with the one used on his 17in cylinder 0-6-0 (LNER J33). One batch of six "574" locomotives was built at Cowlairs. The "633" class was built between 1890 and 1895, and was intended for heavier duties. The "633" class had a slightly larger boiler (4ft 6.25in vs. 4ft 5in diameter) and 18in cylinders. The coupled wheelbase was also extended from 8ft 3in to 9ft. A total of twenty four "633" locomotives were built in three batches. The "729" class was introduced in 1898 to handle the growing passenger traffic that the North British Railway (NBR) was seeing in the 1890s. The NBR also needed new express locomotives to haul express trains on the Edinburgh to Berwick section of the East Coast main line, after it terminated a joint-running agreement with the the North Eastern Railway (NER) in 1894. The "729" locomotives were larger still, with 18.25in cylinders and 4ft 8.125in diameter boilers. Twelve "729" engines were built in 1898, and they were followed by six more in 1899. All six "574" engines were rebuilt by Reid in 1911, using modern Reid boilers that matched the dimensions of those used on the later "729" class. 8.25in diameter cylinders were also fitted, and the coupled wheelbase was extended to 9ft. As the original boilers of the "574" and "729" locomotives came up for renewal, they were replaced by the same Reid boilers. These rebuilds started in 1918, and were completed by 1922. The last eighteen locomotives were rebuilt during the tenure of Chalmers, and were built with a distinctive straight chimney and helical springs on all axles. These springs contrasted with the other D31s which used laminated springs for the bogie and the front driving axle, and helical springs only on the rear driving axle. The LNER classified these latter engines as D31/2 from 1927, but this distinction quickly fell out of use. Over time, they tended to lose their chimneys, but they retained their helical springs until withdrawal. All three varieties had "steam-jacketed cylinders". These had divided ports, with the exhaust steam passing round the cylinder on its way to the chimney. All of the NBR locomotives built by Drummond, Holmes, and Reid with 18in or 18.25in cylinders used this design. All three types were built with lever reversing gear, but vertical screw gear was used in all of the rebuilds. The "729" locomotives were built with combination injectors. The other two classes were built with (and retained) the non-lifting pattern. Spare boilers (LNER Diagram 80) were built in 1925-6. These used Ross pop safety valves instead of the earlier NBR lock-up type. The "574" locomotives were initially allocated to lighter express duties, due to the existence of the more powerful Abbotsford class. The later "633" engines were used on heavier traffic, including the Edinburgh-Aberdeen and Edinburgh-Perth services over the newly opened Forth Bridge. These duties were followed by further duties on the Waverley Route, and East Coast express duties to Berwick. The "633" locomotives also participated in the Edinburgh to Aberdeen leg of the "Races to the North". In order to reduce the strain during racing, engines and crews were changed at Dundee. The fastest time was recorded on 22nd August 1895, when Edinburgh to Dundee (59.2 miles) was covered in 59 minutes, and Dundee to Aberdeen (71.3 miles) was completed in 77 minutes. Although the load was only 86 tons, this record still stands today. With larger locomotives entering traffic from 1903, the D31s gradually moved to a wider range of duties including stopping main line trains, cross country services, and even some branch line services. By Grouping (1923), the D31s were allocated to: Haymarket (7), Perth (6), Thornton (6), Dunfermline (5), St. Margaret's (4), Carlisle (3), Eastfield (3), Hawick (3), Stirling (3), Aberdeen (2), Bathgate (2) Parkhead (1), Blaydon (1), Dundee (1), and Berwick (1). In 1924, a number of ex-Great Northern Railway (GNR) D1s and D31s were moved to the former Great North of Scotland Railway (GNSR) section, after the withdrawal of aging ex-GNSR 4-4-0s. Regular transfers of surplus D31s from ex-NBR lines to ex-GNSR lines would continue throughout the LNER's existence. As well as this migration to the ex-GNSR lines, the D31s tended to be allocated to lesser sheds and duties over time. The first D31 was withdrawn in 1931. General withdrawals started in 1933, and were steady until the outbreak of World War 2 (1939). One was withdrawn during World War 2, leaving sixteen in service. Post-war withdrawals were rapid, and only seven survived to Nationalisation (1948). Final duties still included occasional duties over the Waverley route. No. 62281 was recorded double-heading an A3 4-6-2 over the Waverley route on 3rd February 1951. No. 62281 proved to be the last D31 in service, and it was withdrawn in December 1952. Heating Surface: Total: 1266.1 sq.ft. The last D31 was withdrawn in 1952, and none have survived into preservation. I am not aware of any models of the D31 in any scale.